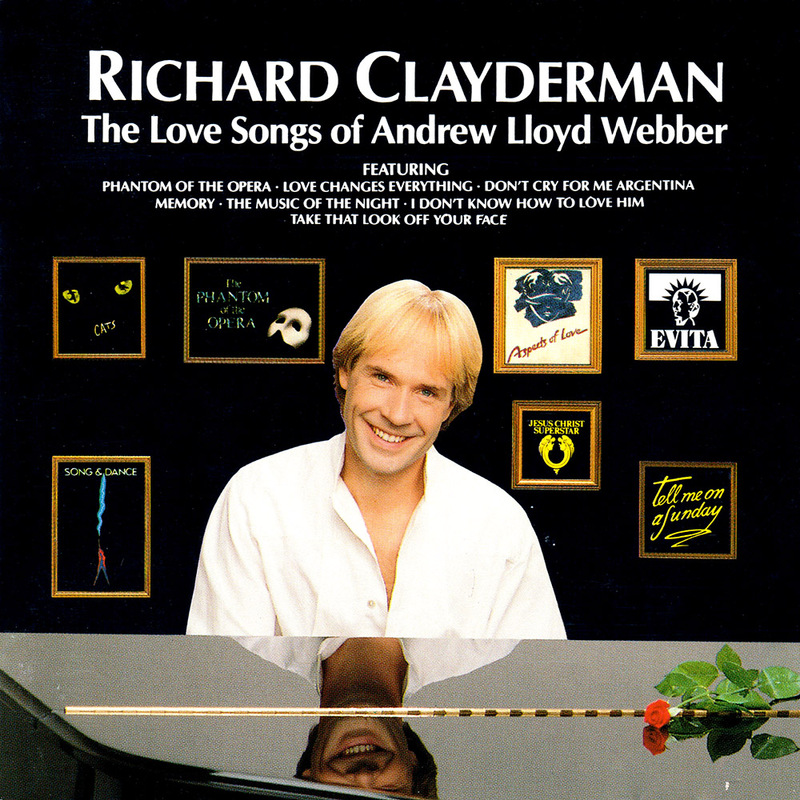 ‘The Love Songs of Andrew Lloyd-Webber’ is a studio album featuring 12 titles from 7 Andrew Lloyd Webber musicals, including ‘Phantom of the Opera’ and ‘Evita’. This album has been released in many formats around the world, such as ‘Best of Andrew Lloyd Webber’ and ‘Aspects of Richard Clayderman’. ‘Phantom Of The Opera’, ‘Don’t Cry For Me Argentina’, ‘High Flying Adored’ and ‘Take That Look Off Your Face’. In the theatre Andrew Lloyd Webber’s music takes on the epic quality of it’s productions. His scores are an integral part of the whole package and all too often their individual charms get lost in the razzamatazz which inevitably surrounds the launch of each new blockbuster show. As a critic, in the haste of an overnight review, I often find myself discussing the overall sweep of the music, the thrilling theatricality of the concept, the merits of the star’s performance and all manner of other production details. Later, however, the separate, persistent melodies remain entwined in the memory. Songs which have a life of their own, above and beyond the show which spawned them. Here, Richard Clayderman recalls some of those which take their rightful place among the enduring standards of musical theatre. From one of the earliest Lloyd Webber-Tim Rice musical hits, the bitter-sweet ‘I Don’t Know How To Love Him’ from Jesus Christ, Superstar to ‘Love Changes Everything’ from his chamber-opera ‘Aspects of Love’, there is a tender haunting insistence underlying all the numbers on this album. Once heard, like all the finest popular music, the melody lingers on.